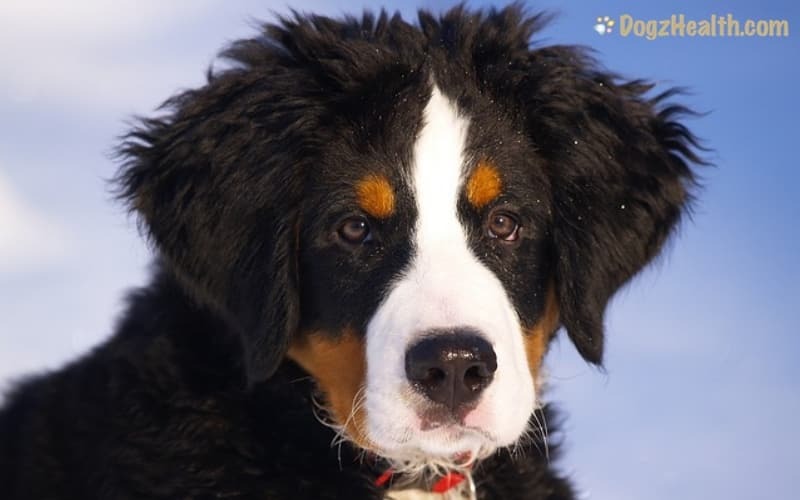 Runny nose in dogs can be caused by infections, allergies, or even periodontal problems. By looking at the nose discharge (e.g. whether it is watery or bloody), we can have a general idea about the cause. Read on and learn more about the types of nose discharge and the possible causes for dogs to have a runny nose. A dog’s nose is usually moist and cool, but not dripping wet. A dog having a runny nose very often indicates that there is an irritant in the dog’s nasal passage. The irritant can be a foreign object, an allergen, or an infection caused by microorganisms such as bacteria. Usually, sneezing and nasal discharge occur together. Sometimes, when a dog is excited or nervous, his nose is runny with a clear watery discharge. This type of nasal discharge is not accompanied by sneezing, and usually goes away when the dog calms down. A dog with a runny nose that does not get better for several hours is cause for concern – it suggests a more serious problem. If you dog has a persistent runny nose, watch out for other signs such as sneezing, postnasal drip, gagging, and retching. Also look carefully at the nasal discharge to see if it is clear and watery, or if it is blood-streaked, bloody, or cloudy (contains mucus). Note if the discharge is from one or both nostrils. By paying attention to the above, you can have a better idea as to what causes your dog to have a runny nose. Allergies, such as seasonal pollen allergies, and canine atopy, can cause a dog’s nose to be runny. If your dog has a runny nose only seasonally (e.g. in spring or fall), and the nasal discharge is clear and watery, chances are he is suffering from seasonal pollen allergy. Dogs suffering from canine atopy can develop allergic rhinitis. Typically, the dog will suddenly start sneezing and have a runny nose with a clear watery discharge. Dogs with atopy also have very itchy skin, runny eyes, and sneezing. Rhinitis is a nasal infection, whereas sinusitis is a sinus infection. Both rhinitis and sinusitis cause symptoms such as sneezing, nasal discharge, gagging or retching from a postnasal drip. Allergic sinusitis or rhinitis may occur seasonally caused by pollen, but it may also be caused by something in the house. Some such irritants include cigarette smoke, house dust, mold, air freshener, etc. If your dog plays outside, he may be exposed to chemicals such as pesticides and herbicides. Usually, a dog with sinusitis or rhinitis will have nasal discharge that is thick and foul-smelling. In younger dogs, rhinitis and sinusitis are more commonly caused by respiratory diseases. On the other hand, in older dogs, tumors and periodontal diseases are more common causes. A number of serious upper respiratory diseases can produce initial symptoms similar to those of the human cold, such as a runny nose, sneezing, coughing, and eye discharge. 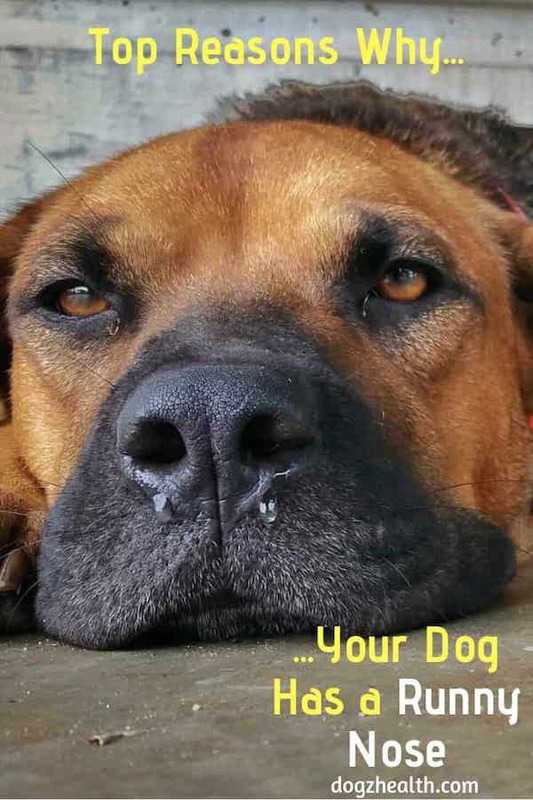 In more serious cases, such as canine influenza, the dog may have a yellowish nasal discharge, accompanied by coughing, fever, appetite loss, and lethargy. Dogs with pneumonia caused by distemper, for example, can also show similar symptoms such as nasal discharge, coughing, fever, and rapid breathing. If your dog shows these symptoms, consult a vet immediately. Periodontal diseases such as periodontitis and abscessed teeth may cause nasal discharge in dogs. Nasal discharge as a result of these problems is chronic, pus-like (sometimes blood-streaked), and comes from one nostril. Nasal tumors can cause nasal discharge from one nostril, accompanied by sneezing and sniffling. The discharge is chronic, pus-like, and sometimes blood-streaked. Nasal tumors can also cause facial swelling. Dog runny nose can also be caused by a foreign object caught in the nasal cavity. The object can erode the mucous membranes in the cavity, causing a blood-streaked mucus nasal discharge, or even a nosebleed. It is difficult to remove foreign objects from a dog’s nasal cavity. It is a procedure best done by a veterinarian. A natural product that may help dog runny nose is HomeoPet Nose Relief . It is a nose drop that gives fast relief without chemicals and without side effects. 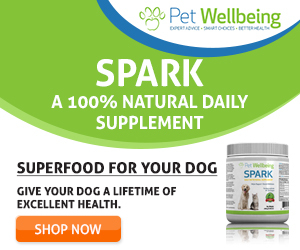 Give it a try if your dog has the occasional runny nose and sneezing due to allergies. It is important to remember that persistent dog runny nose should be seen by a veterinarian to determine the underlying cause. Also, nasal discharge that is mucoid, blood-streaked, bloody, and/or foul-smelling is alarming and the dog should receive immediate veterinary attention. Nasal discharge that is mucoid, blood-streaked, bloody, and/or foul-smelling is alarming and the dog should receive immediate veterinary attention.